Squeaker on my washing line! Tonight, way after dark, I was going to take a cushion cover off the washing line and discovered a squeaker perched on it!! We startled each other, and the squeaker flew off, onto the roof of the annexe. It's still there, on the rain guttering, way out of reach. I think it's Charlie, but it was all too quick. 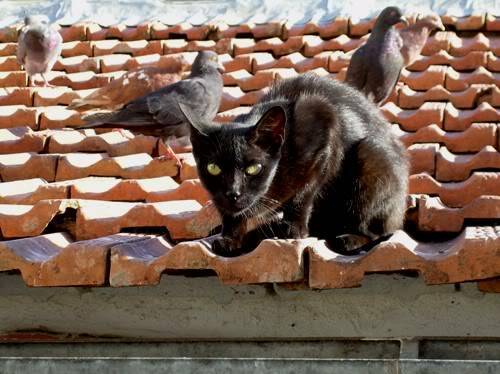 I worry about a black-and-white feral cat I have to watch out for when I feed the ferals, as he is NOT pigeon-friendly. Thankfully Patch is around, I saw her earlier sleeping at the other end of the roof. She doesn't harm the pigeons, and she hates that cat because he attacked her a couple of times. I hope she'll keep him away until dawn. I hope Charile (or whoever it was) stays safe. It WAS Charlie, and she's fine! When I went to bed, around 4 am, I left my daughter and her friend Kim (who's here on holiday from the UK) in charge of checking up on her regularly while they were up, and especially be aware of any sounds of cat fights. But I couldn't sleep for more than an hour at a time, anyway. At 6 am she was still there, but just before 7 there were 5 adults foraging on the roof... and Charlie, the only squeaker among them! She must be trying to nest as close to the house as possible. I wish she came indoors for the night instead, that would be much safer. This also proves what we've been saying about pigeons flying or not flying at night: there's so much light round here 24/7 that you cannot use night time to catch them, they just take off. I'm glad Charlie is safe and sound. Glad to hear that baby Charlie made it save through the night! I would be worrying too if feral cats roamed around. Glad to hear Charlie made it through the night safe and sound. I know the feral cats need to survive as well, but I'm always worried for my ferals as well. Before I feed the ferals and they come down from the roof I always let my dogs out. This seems to keep the cats at bay. Too bad there aren't otheer birds of similar age, in the flock, for Charlie to buddy up to. I've noticed here, that birds for similar age tend to hand out together. There are some, but they're a bit younger, and Charlie teams up with the young adults that come most often to the window sill. They must look familiar to her, as she saw them often enough from her cage near the window. They even landed on her cage sometimes! There are three feral cats that come round here. The two black ones were raised with the feral pigeons, and they are absolutely trustworthy with them. 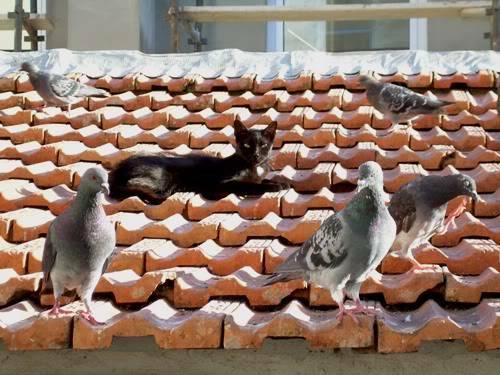 One, KT, is shy, but Patch sits with the pigeons on the roof and sunbathes. The black-and-white cat, however, is definitely not pigeon-friendly, and as I can't reach the roof I keep him at bay with a water pistol when I'm feeding the pigeons. Unless Patch is around, of course -- I mean, would YOU mess with this cat? There was that mishap with the kittens, but that was just pure panic and the maternal instinct kicking in all wrong. I'd never heard or an oral contraceptive for cats until you just mentioned it, and so I googled it. Is this what you are giving her?...Or are there others now? It's a great concept but the side affects look extreme. All in all...I think it's worth it though. I knew the name (Patch) sounded familiar but it didn't connect who she was until you mentioned the kittens. She's a beauty. Absolutely stunning in the first photo. No, it's not that one, it's Megecat (Megestrol acetate), which according to the manufacturers has a tolerance limit of one pill every other day for the first and the last 3 weeks of the treatment period -- nowhere near as heavy on the side effects. After checking with the vet, Patch got one pill a fortnight for the first 2 months, and then one a month. And KT is on the pill too. No pill should ever be given to a cat that is already on heat (that can be dangerous, because it forces the womb to contract very quickly, and that's what accounts for the worst side effects). It should be started before that, and maintained until the end of the reproductive season. The pills are very small and easy to include in food (like a bit of cheese or of cat meat), but they can also be ground up and mixed into the food. Subject: Re: Squeaker on my washing line!